When tackling projects with short deadlines and tight budgets, production teams need to build an overall picture of that production to ensure they make the right decisions. Dashboards are an excellent way for ftrack users to do just this, with quick, at-a-glance insight into the progress of any ongoing project. ftrack dashboards enable users to view, analyse and act upon the information contained within ftrack, via a customisable canvas which visualises key production data on a single page. It gives users instant analytical access to the information they need in a highly readable, meaningful way. ftrack dashboards are fully customisable and can be tailored to the way a user wants to work. They are comprised of “Widgets” – discrete, bite-sized chunks of ftrack, which package up and present specific elements of information. Using a simple drag-and-drop interface, users can add and reorder Widgets in the dashboard to prioritise certain types of information and create a workspace that makes them feel more at home. So, if you’re just starting your day in the studio and immediately need to know the current status of all tasks, which tasks still need to be started, any important upcoming dates and what resources are currently assigned, you can apprise yourself of this information in 30 seconds. What if there is information specific to your studio or project that isn’t reflected in a preloaded ftrack Widget? If you’re a developer, you can add your own custom Widgets by building a web page that uses the ftrack API and show it using the ‘web view’ dashboard Widget. You can create as many custom dashboards as necessary to make your day to day more effective. If you want other team members to have access to the dashboards you create, they can be easily shared with multiple colleagues. 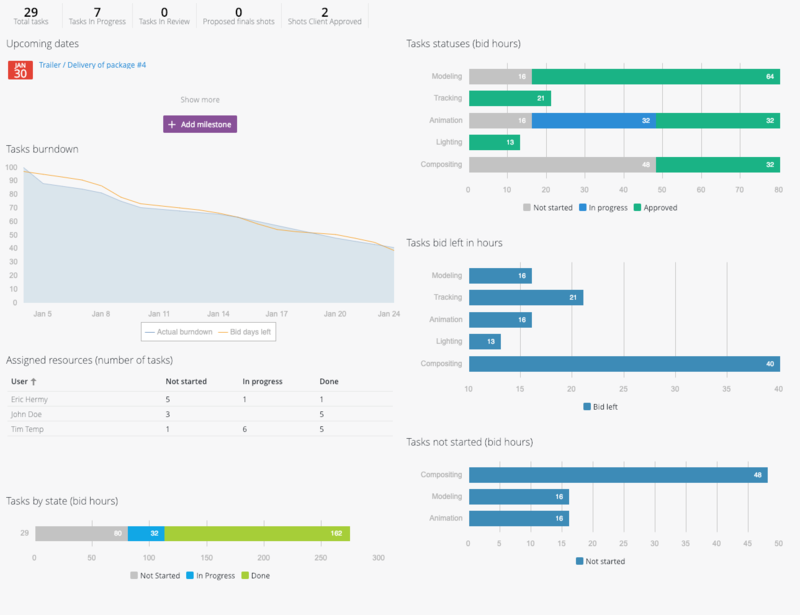 Go to the project you’d like to create a dashboard for. Click Create dashboard in the dashboards menu, or the plus icon. Enter a name for your dashboard and select layout: one large area, two or three columns. Click Create. In the next dialogue, you have the possibility to add the Widgets you like to create the dashboard you want. Select Widgets and click Done. To see your new dashboard in action, click Save and your dashboard will be reloaded. If you’d like to know more about dashboards, or you simply have some feedback about the interface you’d like to share with the ftrack team, then please don’t hesitate to get in touch.